I frequently describe weeds as "sneaky" when their life-cycle presents a serious challenge to their identification and management. However, nothing matches the sneakiness of the hide-and-seek life-cycle of Lesser Celandine (Ranunculus ficaria = Ficaria verna). This non-native is known as a "spring ephemeral" owing to the time of year when the short-lived plants and flowers are present. Most of its life-cycle is spent hidden from view as underground tubers. Shoots begin to rise in southern Ohio from the tubers in late-January to February, depending on environmental conditions. As spring progresses, this highly invasive plant fully reveals itself as creeping green carpets speckled in yellow laid over forest floors or beneath landscape plants. However, its ephemeral nature means plants collapse and disappear from view in early summer. The weed is not gone; it survives as recharged tubers. It's a very sneaky weed. Lesser celandine belongs to the buttercup family, Ranunculaceae, and is sometimes called "fig buttercup." The "fig" refers to the shape of the underground tubers and "buttercup" describes the flowers. The alternate common name of "pilewort" speaks to using extracts from this plant as an herbal remedy for hemorrhoids (piles). The practice is strongly discouraged because the active ingredient, ranunculin, can cause liver damage in humans. Grazing animals have been known to be poisoned by feeding on the plant; presumably they didn't suffer from hemorrhoids. Lesser celandine is native to Europe, northern Africa, western Asia, and Siberia. It is believed to have been first introduced to North America as an ornamental in the mid-1800s and escapes were reported in Pennsylvania in 1867. Its glossy butter-yellow flowers are about 1" in diameter and borne singly on stalks. Succulent, shiny dark green kidney or heart-shaped leaves are borne on fleshy, white, tightly clustered leaf stalks. Take care not to confuse our native Marsh Marigold (Caltha palustris) with lesser celandine. Both are spring ephemerals that belong to the buttercup family with plants sporting similar looking yellow flowers. However, lesser celandine flowers have 3 green sepals and 7–12 yellow to faded yellow petals. Marsh marigold flowers have 5–9 yellow petal-like sepals. Also, marsh marigold leaves are much larger and plants lack underground tubers and above ground bulbils. Of course, as its common name implies, marsh marigold does not wander far from wet environs. Digging up lesser celandine plants will reveal a stockpile of potato-like tubers used to store resources to support springtime top growth. Movement of the tubers in contaminated soil or plant material can spread lesser celandine to new locations. A close examination of leaf axils near the base of the plants will reveal peculiar protuberances called bulbils. They can also give rise to new plants and are perfectly suited for being picked-up in the dew claws of deer. Indeed, deer are a major mover of lesser celandine and play a pivotal role in carrying this invasive plant to new locations. Although plants seldom rise more than 4 -5" above the soil, the leaves overlap to form a mat-like impenetrable canopy and plants produce dense root systems. Both of these growth features present a serious challenge to low-growing spring wild flowers, particularly our native spring ephemerals. I've observed cutleaf toothwort (Cardamine concatenate) and Dutchman's breeches (Dicentra cucullaria) yielding to lesser celandine. Lesser celandine has long been described as preferring moist, sandy soil, and thriving along streams and riverbanks as well as wetlands. However, it has paid no attention to our written descriptions. While it certainly does well along streams, broad mats of this non-native invasive may be seen covering entire hillsides in Ohio. 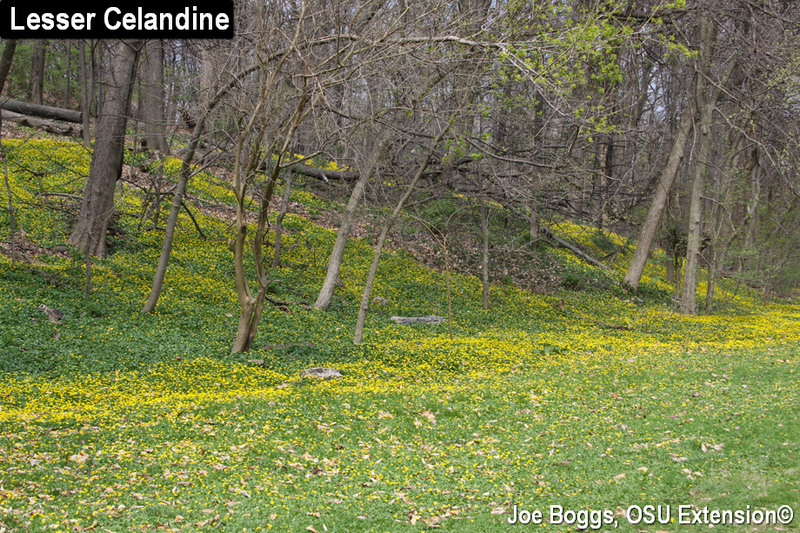 As a result, lesser celandine appears on the Ohio Department of Agriculture's List of Invasive Plants. As of January 7, 2018, plants on the list were prohibited from being sold or distributed in Ohio [see More Information below]. Given the environmentally disastrous consequences of allowing lesser celandine to spread unchecked, I strongly urge that you eliminate this non-native invasive weed as soon as you spot it. Management becomes more problematic once it becomes well established as a large colony. Recommendations for eliminating small colonies includes digging and destroying plants along with the tubers. However, based on reports I've heard from frustrated landscape managers and gardeners, this effort usually morphs into an ongoing game of whack-a-mole. It can be very difficult to remove all of the tubers from the soil. Herbicides are the most effective long-term management tool. However, location plays a significant role in their selection and overall efficacy. For example, many of the selective herbicides labeled for use on turfgrass are highly effective against lesser celandine that has crept into lawns. These include MCPA, dicamba, and triclopyr. Keep in mind established colonies that are supported by huge numbers of underground tubers may require multiple applications over a number of years. The same is true for managing lesser celandine in landscapes and wooded areas. The larger the infestation, the longer it will take to wipe-out this stubborn weed. On the other hand, non-selective herbicides may be brought to bear with the weapon of choice being glyphosate (e.g. Roundup) owing to its ability to translocate to affect the tubers. Pelargonic acid (e.g. Scythe) does not translocate – it's a contact herbicide – but products with this non-selective active ingredient may have a lower impact on preferred plants. Landscapers using the highest labeled rate have had some success. However, combination products containing glyphosate plus pelargonic acid or glyphosate plus diquat may be a better choice where non-target plants can be protected or avoided with directed sprays. Regardless of the non-selective herbicides you decide to use, multiple applications per season over multiple seasons is generally required to eradicate lesser celandine. The first application should target plants as they emerge in winter; this usually occurs in southern Ohio sometime in late-January to February, depending on environmental conditions. Additional applications should be made based on assessing the results of previous applications. Although lesser celandine is already rolling along at high speed this season in southern Ohio, our slowly emerging spring is providing something of a reprieve. Plants remain lush, healthy, and a great herbicide target, so it's not too late to initiate a suppression program. Of course, there's even greater opportunities in the central and northern parts of the state. However, the clock is ticking!